I love to serve a wonderful vegetable with a great meal. You can find so many different vegetables to serve at your dinner table. 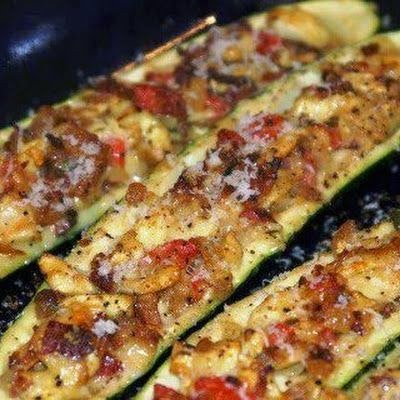 So try this recipe stuff zucchini and add it to your recipe box in the column of vegetables. CUT zucchini lengthwise in half; scoop out centers onto cutting board, leaving 1/8-inch-thick shells. Place shells in 13x9-inch baking dish. Take zucchini flesh and chop fine. Melt 1 Tbsp. butter in large skillet on medium-high heat. Add onions, garlic and chopped zucchini; cook and stir 3 min. or until onions are crisp-tender. Add tomatoes and crispy bacon; cook 2 min. Stir in cheese. Spoon into zucchini shells. MELT remaining butter in same skillet. Add panko crumbs and basil; cook and stir 3 min. or until golden brown. Sprinkle over filled shells.